Tunes your Gibson electric guitar automatically, has lots of alternative tunings as presets and allows you to store and recall your own tunings. 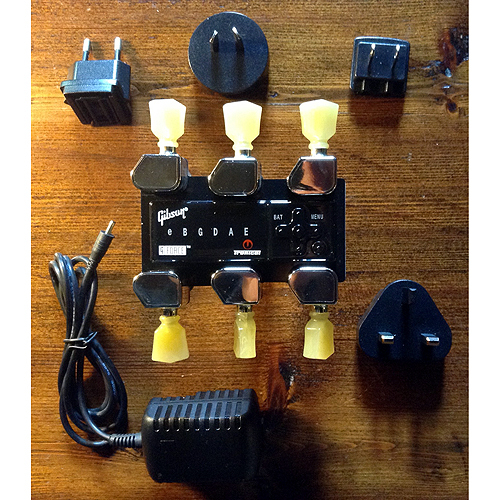 Complete with battery, Gibson charger and adapter plug set. 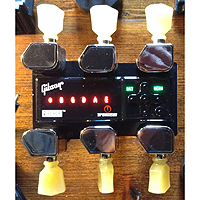 Basic operation of the tuners is really easy you just turn the system on and strum. The note names appear on the unit in green if it's in tune and red for out of tune. For more accurate tuning you pick each string individually and the G Force tuners will adjust the pitch precisely. In addition the tuners have a menu of 3 memory banks allowing you to tune to standard major tunings, drop tunings and the 3rd programmable bank that allows you to create your own non standard tunings and recall them later. You can of course tune the guitar in a standard way when the device is turned off and with the units gear ratio of 40:1 this allows for very accurate pitch. The only part of the process that is really different to standard tuners is in re stringing the guitar. Because of the 40:1 gearing restringing the guitar would take a long time to do by hand and using a string or peg winder could seriously damage the gearing mechanism. To get round this Gibson G force has a button on the menu that will automatically wind the string onto the string peg and up to pitch. Each machine head contains a small servo motor that can wind the string up or down. The Gibson G FORCE™ servos are optimized for guitar tuning (small size, light weight, and high speed) and can also be tuned manually. The manual option is helpful in case you forget to recharge the battery (it does around 100 tunings on a single charge), but also allows creating custom tunings manually, which you can then store for future recall. The controller senses string vibrations, then measures each string’s frequency. If a string is off-pitch, the controller sends a correction signal to the servo motor to wind or unwind the string as needed to compensate.